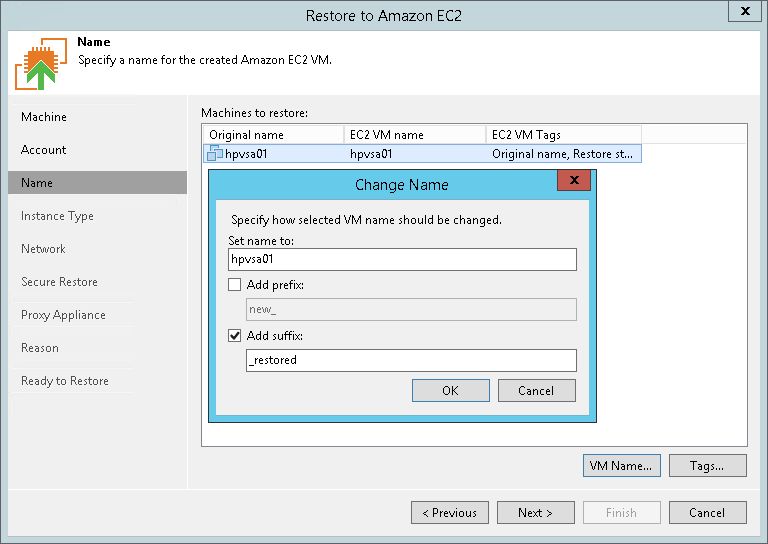 Veeam Backup & Replication restores the machine to Amazon EC2 as an instance. An instance is a virtual machine in Amazon EC2 with a preconfigured combination of computing resources. By default, Veeam Backup & Replication uses the original machine name for the target instance. However, you can define a new name for the instance if necessary. In the Machines to restore list, select the machine and click VM name. You can use AWS tags to categorize instances in Amazon EC2. A tag is a label with metadata that includes two properties: a key and a value. For more information on AWS tags, see the Amazon AWS documentation. By default, Veeam Backup & Replication adds the Original name and Restore start time tags for the target instance. However, you can modify or delete these tags, or add new ones. In the Machines to restore list, select the machine and click Tags. In the Tags window, click Add. In the EC2 VM Tag window, specify the Key and Value properties. Note that you cannot add the tag with the Name key. 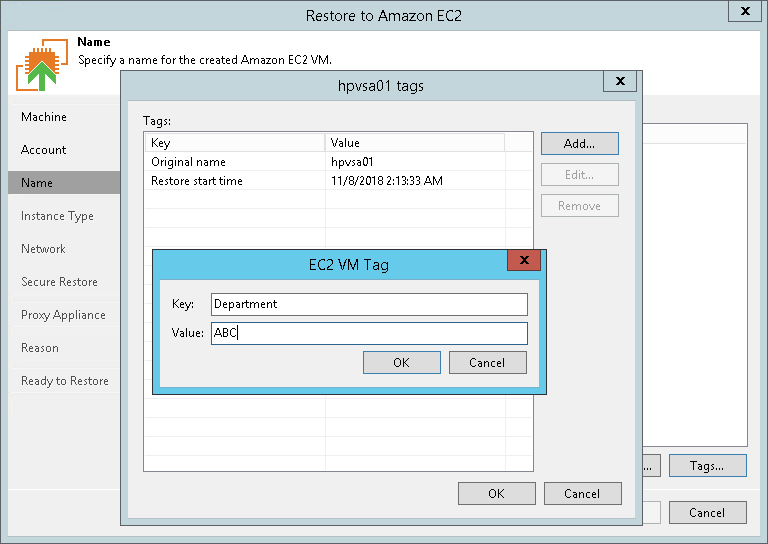 Veeam Backup & Replication uses the Name tag to set the name for the target instance in Amazon EC2. In the Tags window, select the needed tag and click Edit. In the EC2 VM Tag window, edit the Key or Value properties. In the Tags window, select the needed tag and click Remove. If you restore a machine from backups of an EC2 instance, Veeam Backup & Replication displays tags that were assigned to this instance. You can modify or delete these tags as well.